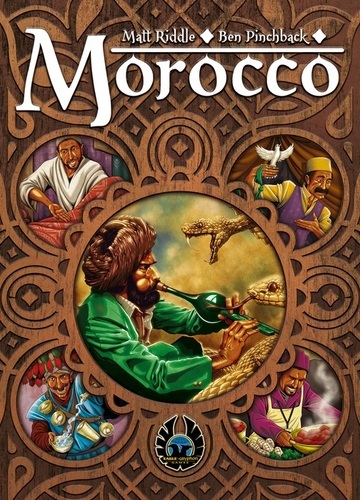 Morocco is a area majority game set in the market of Marrakech, Morocco. The board shows a 5×5 grid of market stalls with four spaces in each stall. There is a rooftop which overlooks the market on the left hand side of the board. 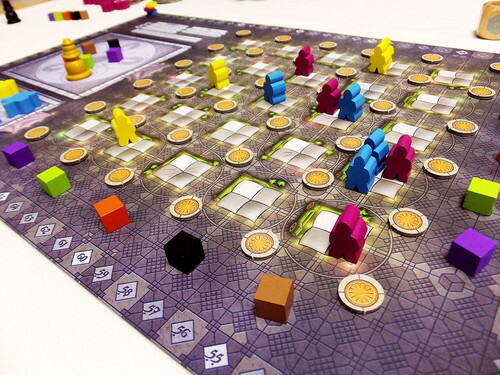 Each player chooses a color and most of the bits of that color (except the larger bodyguards which are put in the lower left corner of the board). There are five colors of information; three full sets are chosen out, and one set is randomized to the rooftop, the bottom of the board and the right side of the board. Finally, the juice markers are randomized and placed in the corners of all the stalls in the 5×5 grid. 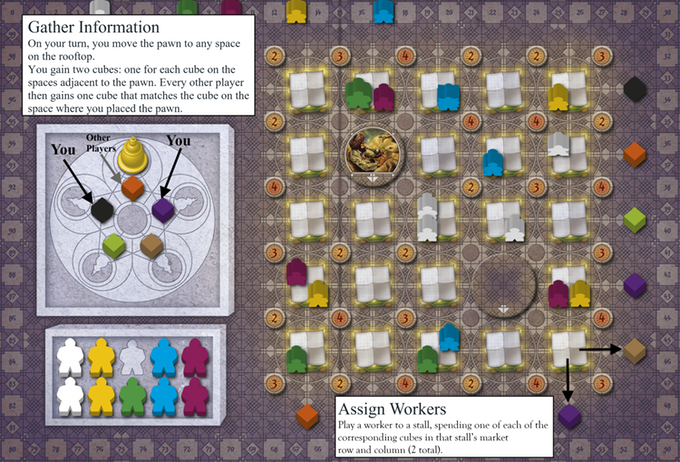 Each round has two phases: Scouting Stalls (getting cubes) and Assigning Workers (playing cubes). In this first part, players focus on the rooftop to the left of the market. Each of the five information cube colors are represented there – their positions determined randomly at the start of the game. Each player will move the pawn onto the space above one of the cubes. The active player will take two cubes – each of the colors adjacent to the pawn. All other players will get one cube – the color where the pawn is. This continues until all players have placed the pawn and cubes have been distributed. In the second phase, you will now use these information cubes to place your workers in the most advantageous locations. Each player will get two placements in this phase, one at a time. In general, you need to play two cubes to play a basic worker or a bodyguard piece. You look at the color of cubes on the row and column where you want to play and you must play matching cubes. If you wish to play your special pieces (tourist or cousin token), you must also discard a third cube of any color. At any point in your turn, you can spend a coin to exchange the positions of any two cubes in the same area. Each piece takes up one of the four locations at a stall. You can place your piece in any unoccupied space. If you use a Cousin token, you can play one piece in the chosen location, and then play a piece in a stall space directly across the walkway from the original piece. A tourist piece is placed like normal but it will play a special role in scoring. Bodyguards are slightly larger pieces; and while they still only occupy one space, they count for two when measuring the occupancy of a market stall. After you place your piece, you always check to see if that stall is now fully occupied – that is, does it have a worker count of four or more after placement. Each regular piece and tourist is worth one. Each bodyguard is worth two. And, adjacent stalls may contribute one worker due to overflow (more on this soon). If the count is four or more, the stall is scored. All players take the juice token in the corner where there piece is (if there is still a juice token there). Then if there is a player with more workers than all other players, that player “wins”, he scores 5VP and then places a marker tile on that space. This token has an arrow on it, and this arrow acts as an overflow into that adjacent market and counts one towards the worker count in that stall. This may cause a cascade of stalls that score on this turn. If there is a tie for first place, each tied player gets 5VP and a neutral stall tile is placed. Sole second place scores 2VP, 1 gold coin and 1 bodyguard piece from the supply. Tied second place or third place is 1VP, and then the choice of 1 gold coin or 1 bodyguard. Finally, if there were any tourist meeples in the stall that was just scored, they now move into empty spaces in the direction of the arrow on the stall tile just placed. This may also cause a cascade of scoring to happen. After two rounds around the board, the round ends. You can check to see if the game ends – if there are five or fewer open stalls left in the market. Otherwise, you pass the start marker clockwise and start another round. Each player is only allowed to keep one cube from round to round, so any in excess of this number must be returned to the supply. The winner is the player with the most points. Ties go to the player who has claimed the most stalls. Morocco is a very solid game. I have enjoyed my initial plays of the game, as I enjoy the puzzle like strategy needed to figure out how to use your cubes to play your meeples where you want them to go, and then a further layer of puzzle figuring out how they will interact with other meeples and with the overflow markers. In the first phase, you need to figure out potential options for where you will want to play your pieces. You are at the mercy of your opponents for the majority of your cubes; you will only get to choose where you place the marker once. So you make the best that you can with your one choice, and then when you have your full complement of cubes, then you modify your plans to make the best with what you’ve got. If you’ve been fortunate enough to have picked up gold coins in a previous round, you will have a lot more flexibility as you can possibly modify the cubes on the rows and columns to suit your purposes. Don’t forget that you can also use your cubes to modify those cubes after your placement, if nothing else to thwart your opponents from playing in particular places! In the course of the game, players will often try to stake out their own territory – as the endgame bonus of 3VP per continguous tile area is strong. The market stall tiles help you create chains as you generally get a +1 influence on an adjacent stall each time that you win one. However, it takes a lot of resources to close out a stall on your own, so you’ll still likely need help from your opponents. You might be able to entice people to join you by leaving the higher valued juice tokens available. Opponents may also be willing to come fill up stall to capture an easy second place. 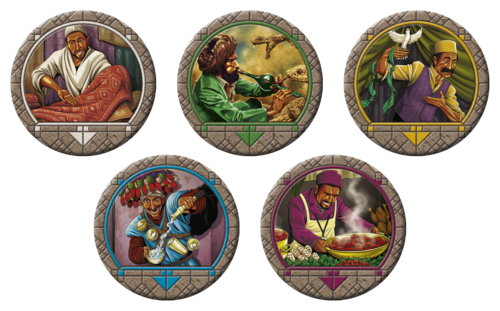 Coming in second or third is the only way to get the gold coins or the bodyguard meeples –and these can be very valuable in later plays. For me, the trick is figuring out when I’m just going into a stall for a second place or when I’m trying to go into a stall and actually win it – sometimes for the higher VP count, sometimes to break someone else’s chain. The different types of meeples (including the cousin token) also give you a bit of flexibility in your strategy. You are limited to the number of cousin tokens and tourist meeples (2 each) – so you have to use them wisely. You can only have 2 bodyguards at a time, but they always go back to board storage when scored, so you could theoretically use them more than once assuming that you win enough second places to get them back. There honestly isn’t much new in Morocco, but I don’t necessarily think that this is to the detriment of the game. All of the mechanisms work together well, and they provide the gamer with 45-60 minutes of thinky/puzzly/chewy gameplay without lapsing into analysis paralysis. We’ve played it already 4 times in the first month (which is a rarity in the 2016 gaming universe) and it looks like it will continue to hit the table in the months to come. This entry was posted in Essen 2016, Reviews. Bookmark the permalink.